I am one of you. One of the millions of parents, teachers, students and citizens fed up with the negative impacts of the State of Texas Assessment of Academic Readiness (STAAR) on our public school system, and I have good news. We have a lawyer (Scott Placek). We need to make an investment. 1,000 - $25 donations to get us to our first major outcome. We did our job last year. Citizens got the law changed. We worked with our elected representatives to author common sense reforms to our education accountability system, and the 84th Legislature of the State of Texas passed House Bill 743. 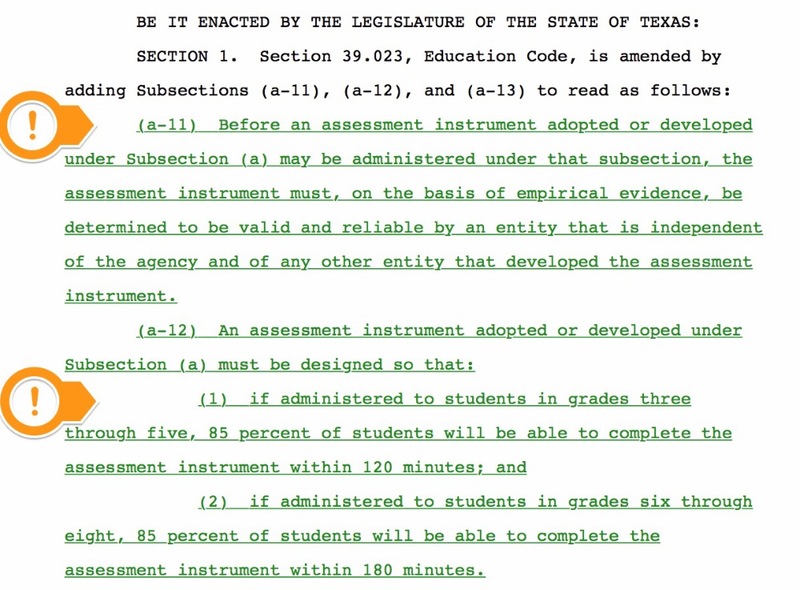 With an overwhelming majority in the Texas House of Representatives (143 to 1) and Governor Greg Abbott signing the bill on June 19, 2015, the new law went into immediate effect, and among other things, brought two major reforms to the standardized assessments given to Texas students. 1) Assessments given to students under the law have to be verified by an entity other than the TEA and the company creating the assessment. No more free passes to the vendors that have been paid over $500,000,000 in the last five years to create and administer these assessments. This provision provides accountability to tax payers that the STAAR does what is expected: measures student and school performance against state education standards. 2) Assessments given to students under the law have to be kept to a maximum time limit. For grades 3 - 5, the assessment must be short enough that 85% of students can finish in 2 hours, and for grades 6 - 8, they must be short enough that 85% of students finish in 3 hours. This provision provides assurance that assessments that had become longer and longer over the years would be limited to a reasonable time frame and done so with student age considered. It is with these two provisions that the Texas Education Agency has failed to comply this year. First, even while students have already begun taking the STAAR, the TEA has not completed a third party validation on any of the assessments it is administering this year. The TEA said its own validation was enough. 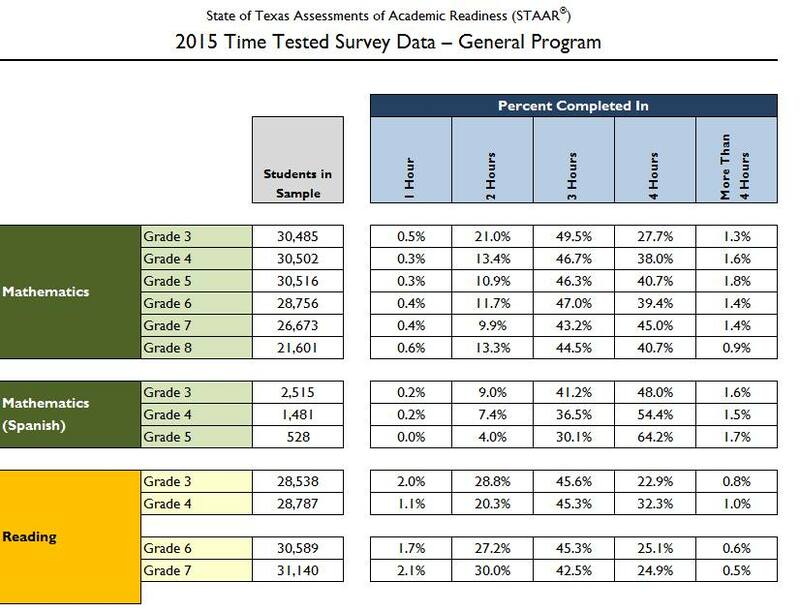 Secondly, TEA’s own data shows that the STAAR in its various forms requires substantially longer than the new statutory time limits. Scott Placek is a partner at Arnold & Placek, P.C. in Austin, Texas. He graduated from from the University of Texas School of Law with honors in 1992. While in law school, Scott was a member of the Texas Law Review, Chancellors and Order of the Coif. Scott is a member of the bars of the states of Texas and Arkansas, the Fifth Circuit Court of Appeals, and of the U.S. District Courts for the Northern, Southern and Western Districts of Texas. He and his firm have broad litigation practice across several industries, and he regularly represents clients in administrative proceedings before state agencies. He is AV-rated by Martindale Hubbell for ability and ethics. Scott has several years experience in Texas education law specifically related to standardized assessments and opt out. He represented the Massey family in 2014 when they were one of the first families to successfully opt a child out of the STAAR and has since been a resource to parents around the state through his website txedrights.net and various online support groups that he administers. Scott Placek and his firm have agreed to take on this case at a substantially discounted rate based on personal dedication to the cause and belief that this particular matter has legal merit. Legal battles with experienced attorneys that can prevail over the state's Attorney General are not free. The amount of attorney time and cost to take the case through the three steps outlined above: research, filings and hearings would normally cost between $30,000 and $50,000 over the course of 60 to 90 days. Scott Placek and his firm have committed to seeing the case through these three steps and a hearing on a preliminary injunction for a retainer of $25,000. What happens after. We don't know. It will be after this milestone in the case that a great deal more will be known about what the TEA has done and will do, and the represented parties, funding partners and attorneys can determine the appropriate next steps. Also, as soon as we raise $15,000 on our way to the ultimate goal of $25,000, Scott has agreed to start work with the hope of getting a preliminary injunction hearing by June. This is a particularly important moment in time when we have the agency responsible for regulating public education in our state not following the law. The TEA is not responding to the will of the people who elected the legislature which set the rules for it to operate. The TEA and its leaders have over-stepped their authority and are choosing convenience over the law. We must stand up together and demand the TEA respect our children, respect our teachers, and respect our schools by following the law, and the way to accomplish this is by asking a judge to order it so. The TEA's power must be checked, and no one parent, no one person is going to fund this on their own. 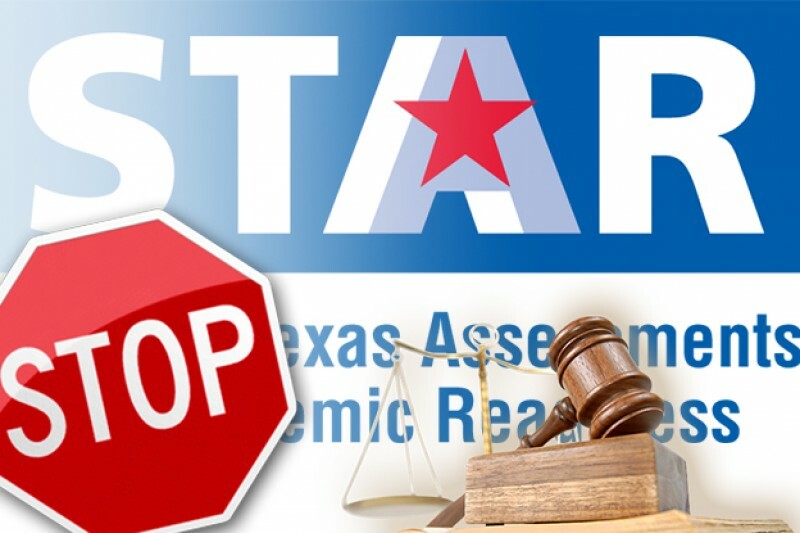 Thousands of students around Texas opted out of the STAAR test at the end of March, and there are hundreds of thousands of frustrated parents, family members and teachers out there supporting this movement. Let's come together to demand the TEA listen. Will you be one of 1,000 supporters to give $25 to make this happen? Or do you have the means to donate $100 or $500 to expedite our cause? Thank you for your concern. Thank you for your voice. Thank you for your support. Note: The funds collected through this campaign will be used to support the litigation of to-be-determined plaintiffs represented by the firm Arnold & Placek, P.C. Any unused funds will be donated to a registered non-profit organization benefiting children. As the organizer of this campaign, I will withdraw donated funds from GoFundMe, consolidate them with donations made offline and then use the funds to pay Arnold & Placek, P.C. as the litigation proceeds. Joshua Tetens (Simer & Tetens) will serve as treasurer and provide independent verification of funds received and disbursed. If you have questions about options for making a large donation, please email me at StopSTAAR2016@gmail.com. Quick update: Scott is contacting and signing plaintiffs this week, and we hope to file suit next week. Thanks for all the support. Supporters: We've hit 70% of our goal and plaintiff selection should be complete this week! A big thank you to the Houston Federation of Teachers which made good on its donor match commitment and then some -- with a $1000 donation to our collective effort. Furthermore, thank you to the thousands of teachers across the state that are standing with parents to fight back against the TEA -- many of whom donated to this campaign anonymously. With another round of STAAR happening this week and with students, teachers, principals and parents feeling the overwhelming stress, it is great to know that our voices will soon be heard in court. I continue to appreciate everyone's support and contributions to the cause. BIG MILESTONE & UPDATE! Okay folks, with half our goal raised, we have the green light to begin FINDING PLAINTIFFS for the lawsuit. Scores from the March STAAR administrations were released just this week which means the results of the TEA's illegal assessment are out and beginning to impact students across the state. It is time to get a judge to stop them. First and foremost, we need parents of 5th & 8th grade students that received NOTICE OF FAILING the Reading and/or Math STAAR from the March 29 - April 1 administration. As a second priority, we are looking for students and teachers at an elementary school currently in its second year of being label "Improvement Required" (these schools are threatened with harsh sanctions like closure if STAAR scores don't improve this year). If you are a parent of a student or a teacher in any of these situations, please email your information to StopSTAAR2016@gmail.com to discuss your specific situation and then be referred to talk with an attorney funded by this campaign. If you're not in this situation, please consider donating to keep our fundraising momentum alive. We will be paying our first legal retainer next week. Thank you for the legal action you are trying to take so that our students get a substantial education and our teachers take back their profession of school without STAAR! Thank you for filing a lawsuit. The STAAR is grossly unfair and has been since its implementation. Learning disabled children that get accommodations in school for their classes are not allowed the same accommodations during the STAAR test. Also, I think that its funny that back when it was 1st out in 2012 that round of 5th graders didn't have to pass it, but the next year the 5th graders had to pass to move to the next grade and the same thing happened last year 2015 with the 8th graders, guess what, those 8th graders last year were the 5th graders back when it 1st came out. So how fair is it that those kids get a BYE on the years that they should have been held back a grade TWICE!!??? Thank you so much! These tests are pointless and all they do is stress out the kids. I know from experience! I am glad someone is fighting back against this exam. As an individual with a Masters in Education and as a parent I disagree wholeheartedly with the STAAR tests. I will pass this along for you! I'm so happy that this is in place. At the moment I'm not financially able to donate funding. These test are unnecessary in my opinion and every year are harder. I have children that don't do well on test due to learning disabilities. And to have to take these types of rest is just cruel. Some of Our greatest America's grew up with their teachers actually able to teach them and with out these "test". It will be a great Day in Texas, if they did away with these pointless exams. & Let our children learn already. Let them have P. E. , Music, & Art EVERYDAY! Along with actual teaching of Math, Reading, Social studies, History, Science. instead of just the "STAAR's" version of teaching. WE THE PEOPLE!!! Stand up! !